Geekulcha is hoping to have around 250 entries from youth who will attempt to resolve community and business challenges. Youth IT organisation Geekulcha is calling young IT enthusiasts of all ages to submit their entries for the fourth edition of the GK 2016 Hackathon. The event aims to bring together IT students, creative young designers, fin tech entrepreneurs, innovators and developers under one roof. 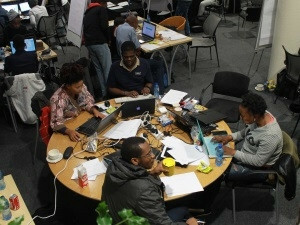 The Hackathon, held in partnership with the innovation hub, is a weekend-long boot camp challenge that challenges the candidates to come up with innovative IT-related business or social ideas, seeking to solve various community challenges in SA, according to Geekulcha. The theme this year, "Smart growing world", is in line with the societal solutions the youngsters will contribute towards fostering technological innovation in the area of education, health, gaming, entertainment, fashion, construction, open data and more, says the organisation. Tiyani Nghonyama, COO and CTO of Geekulcha, says the Hackathon is an intense weekend-long challenge aimed at testing the technical competencies of the young contenders by offering them the opportunity to solve challenges. The experience, he adds, will test their resilience, IT skills and result-orientation. "Contestants will be provided with societal challenges which they will work on for a set timeframe of 24 hrs, using various technologies, application program interface and hardware, to turn their ideas into prototypes which are then pitched on the last day. The second phase of the challenge offers the young candidates an opportunity to propose and develop new ideas and work on solving corporate or business challenges using IOT," explains Nghonyama. Mixo Ngoveni, founder of Geekulcha, says the Hackathon, to be held at the innovation hub premises in Tshwane, is ideal for students or graduates who are seeking employment opportunities with IT companies as the challenge is a hunting ground for skills for partner IT organisations. "We will have IT business leaders as part of the judging panel and others will be presenting the various obstacle challenges. Prototypes will be submitted and pitched on the last day of the Hackathon where solutions will be assessed both on need and best use of IOT implementation. "The top three winning teams will have an employment opportunity with some of the IT companies who will be in the judging panel. Other prizes include a R10 000 cash prize, smart phones; tablets and smart watches," he points out. This year Geekulcha is hoping to have around 250 entries from youth who will join us from the weekend of 24 June to 26th, he anticipates. "Among the winners last year we had a team that worked on a health app that assists patients to search and locate clinics and hospitals within their region. Another innovative idea came from a team that used IOT sensors embedded into the soil to help farmers get an understanding of the soil that they are using in order to produce better crops," he reveals. For more information, visit the Geekulcha portal.